Following impressive wins in the biathlon relay and snowboard slalom, host nation Russia has climbed to the top of the medals table with one day of competition remaining at the Sochi Games. Russia has 11 gold, 10 silver, and eight bronze medals after 15 days of action in Sochi. Norway – which has been relegated to second place – also has 11 golds, but is trailing behind the Russians in the total number of medals won. Canada and the US remain in the fight for the Top 3 in the overall medals count, with nine gold medals each. Norway’s cross-country skiers swept the podium in the women’s 30km mass start free race. Marit Bjoergen clocked in at 1:11:05.2 at the Laura Center, bagging the gold medal. Snowboarder Julia Dujmovits claimed the gold medal in the women’s parallel slalom event. The Austrian beat Anke Karstens of Germany by 0.12 seconds after two runs in the big final. Russian snowboarder Vic Wild managed to beat all his rivals in the men’s parallel slalom event, bagging the gold medal. It’s the second gold in Sochi for the 27-year-old American-born athlete, who took up Russian citizenship in 2011. Speed skaters from the Netherlands raced to gold in the men's team pursuit event at the Sochi Games. Jan Blokhuijsen, Sven Kramer, and Koen Verweij clocked an Olympic record time of 3:37.71 minutes in Final A. The Netherlands also set an Olympic record in the women's team pursuit event. Marrit Leenstra, Jorien Ter Mors, and Ireen Wust clocked in at 2:58.05 minutes at Adler Arena, bagging the gold medal. 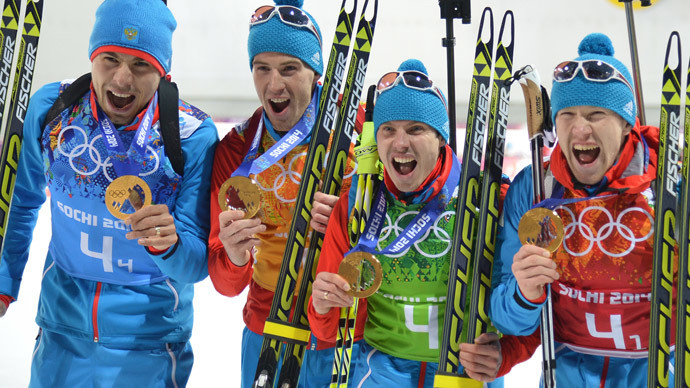 Russian biathletes were the fastest in the men’s 4x7.5 km relay at the Sochi Olympics. Aleksey Volkov, Evgeny Ustyugov, Dmitry Malyshko, and Anton Shipulin shot well to avoid penalty laps and clocked in at 1:12:15.9 at the Laura Center, leaving their nearest rival 3.5 seconds behind. Alpine skier Mario Matt bagged an Olympic gold medal in the men’s slalom event. The Austrian, who was ahead after the first run at Rosa Khutor Alpine Center, proved his class in the second try, finishing with a time of 1:41.84 minutes. Finland claimed the men’s hockey bronze medal at the Sochi Olympics after destroying the US 5-0 in the third place match.